I frequently travel between Lafayette and West Lafayette, and I often take Union Street because of all the construction going on around town, so I’d seen the signs for Niko’s Spicy Pickle. I knew it was there, although it was a little scary to me. Located on the corner of 9th and Union, it’s not exactly in a very restaurant friendly location. It’s a tiny place, just a hole in the wall really, with very little parking. I’d wondered about it, but for lack of information, hadn’t yet dared to try it. And then, all my wonderful friends on Facebook said I must, must, must go. Since nobody on the Internet has ever steered me wrong, I went over there today with a healthy dose of optimism and a full appetite. And boy, was I not disappointed. I parked in one of the few parking spots. There are only a handful, but there’s plenty of street parking. I’m not sure what this building used to be, but from the outside, it’s nothing special. However, I could NOT believe how nice it was on the inside! It was clean with ample seating, nice furnishings, and tastefully decorated. I was impressed! At the counter was a friendly server. We approached and she asked if we were dining in or taking out. We opted to dine in so she gave us all the info we needed on ordering and we took our menus and sat down. The menu was extensive, with everything from subs, pizza, salads, wraps, calzones, and more including appetizers and dessert. It was a tough decision. I ultimately chose the ham and cheese sub and an order of bread sticks, and my friend choose the Stromboli. Once you have decided what you want, you go back to the register to order. These subs come in half or whole sizes. Since I was getting bread sticks, I went with the half but my friend choose the full. We got our drinks (Pepsi products, for those who care – I’m a Coke person) and sat down and after a bit, our bread sticks arrived. And here is where I had to stop and take a picture of the bread sticks. Seriously, will you look at those things? Not only are they beautiful to behold, but they were delightfully delicious! And there were a TON of them. 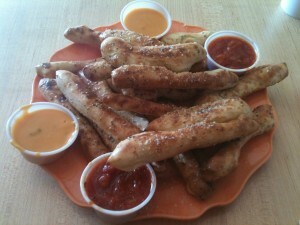 For $4.95, that’s a healthy serving of bread sticks. Next came our sandwiches. We learned when our sandwiches arrived that our idea of whole and half were different than those who created this menu. My sandwich, which I ordered as a half, was a full size sub. My friend’s stromboli, which she ordered as a whole, was TWO full sized subs! So know going in there, that the half size is big, and the whole size is twice is big. The sandwiches don’t come with sides, other than a spicy pickle. They aren’t kidding when they named the place, it was a very spicy pickle! In fact, I don’t think I’ve ever had a pickle quite so spicy. But it was great! Price: Very affordable. Half sandwiches at $4.95 and whole sandwiches at $7.95.